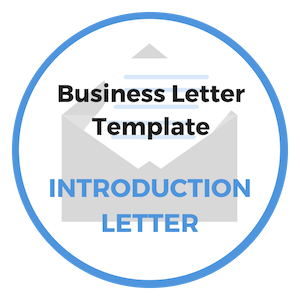 Take advantage of our employment letter template the next time you are preparing to make a job offer to a prospective team member. Job offer letters are often required prior to the candidate accepting the position because the candidate wants to have proof of the offer and read the final terms of the offer. Once all the candidates have been interviewed and you've made your final decision, you will first make a verbal offer by calling the winning candidate. Don't expect the candidate to accept the offer right away. Giving the candidate 24 to 48 hours to think about the position and make a final decision is in the best interests of everyone involved. The last thing you want to do is hire someone who isn't fully committed to your organization. Plus, don't you want to hire people who are thoughtful and deliberate when making important decisions on behalf of your business? Making a thoughtful decision is always better than making a snap decision when it comes to accepting a new job. Being thoughtful may take more time, but it also limits the risk of you having to hire a replacement 6 months later when things don't work out. So, be patient. Immediately after making the offer verbally, attach a formal Offer of Employment letter and send via email. If necessary, send the formal offer via regular mail, but understand that it may take an extra 2-3 days to arrive. Do not contact "runner-up" candidates before the winning candidate has formally accepted the job offer. If for some reason the winning candidate declines your offer, you'll still have the option of making an offer to the #2 candidate without putting anyone in an awkward position. Using our free offer of employment letter template, you can help the applicant make a decision with confidence by including all the important details. In the letter you should restate the official job position, annual salary, associated benefits, work schedule, travel requirement, reporting structure, etc. If the job offer is conditional for any reason, spell this out clearly. For example, if the offer is contingent on passing a drug test or criminal background check, provide details on what is required. and the specific process involved. Correspond with a new applicant right away. As soon as you receive the completed application, respond to notify the sender that you are in receipt of their application and that you will be in contact again by a specific date. Always be positive in your communications, but never give false hope to a candidate. Be upfront about the process and always keep the dialogue professional. Formalize what has been agreed to verbally in a written document. This protects both parties from any misunderstandings. 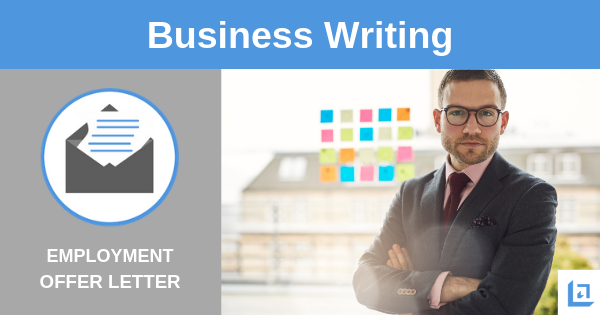 Items to include in an offer letter include: starting date for employment, job description/title, specific details about job duties, areas of responsibility, starting salary and benefits. When writing an offer of employment letter, be clear. Avoid using any details that are not relevant to the offer and communicate only the key facts of the offer. Be sensitive to the fact that the applicant you wish to employ may be working somewhere else now. Make sure your offer letter conveys to the prospective employee that the job you are offering is a great opportunity. Allow the applicant 2-3 days to decide whether or not to accept the position. Consider making the offer on a Friday to give the applicant the weekend to make their final decision. Remember, it's in both party's best interest for the applicant to be 100% positive that this is the right position for them. Otherwise you might find yourself going through the process all over again in a few weeks or months. 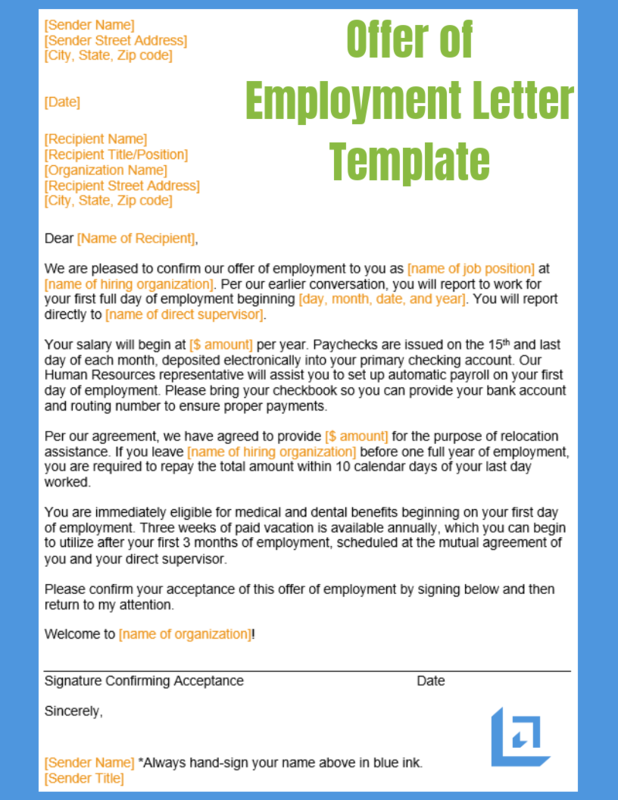 Shown below is an image of our free Offer of Employment Letter template. Use this free tool to make a professional job offer to your winning candidate. 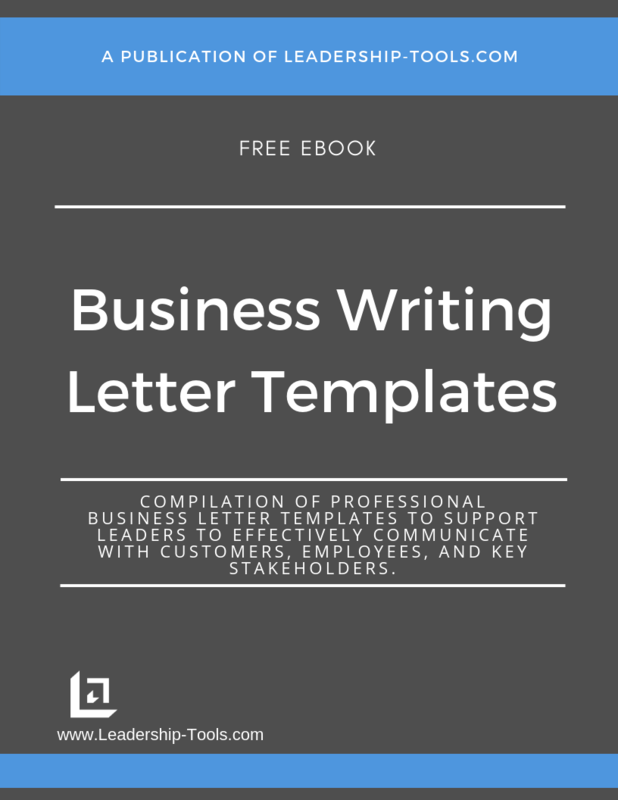 To download our free Business Writing Templates/eBook, complete with the above employment letter template, plus templates for many other topics, simply subscribe to our free newsletter. You will immediately receive a password that grants access to our entire leadership tools library.